Everyone occasionally gets the feeling that someone is watching or listening to them in secret. But, is there a way to tell whether this is just paranoia from watching too many crime dramas, or something more sinister that needs investigating? Read on to find out whether you need an electronic bug detection expert in your home. The first key sign that you might need bug detection is usually people knowing things that they shouldn’t be aware of. This could range from personal confidential information to your business secrets. If there is information out there that you haven’t released, or agreed to release, then you may have a spying problem. The second most obvious sign is changes in the volume of your phone or the phone emitting strange noises. Amateur equipment, in particular, interferes with the phone line and can even lead to the phone making random noises even when it is not in use. Interference on the TV or on AM/FM radios can also indicate the presence of listening devices. If you return home or to the office and find that someone has been in the property, but nothing has been stolen or damaged, then it is highly likely that recording devices or cameras have been installed into the building. It is also worth being wary of electronic gifts from an ex-partner or employee. It is very easy to install devices into such items, which is why they are often used for counter surveillance. One final thing to check is new damage or changes to the building itself; bugs can easily be hidden in false ceilings, behind plaster or in the skirting board. If you believe that you have been subject to surveillance and require electronic bug detection, then Advanced Sweeping are the people to call. We have experienced operatives that are available across the country at short notice. 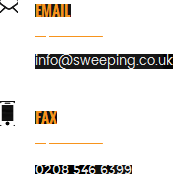 Call us securely on 0845 512 1552 or visit http://sweeping.co.uk/ for more information.